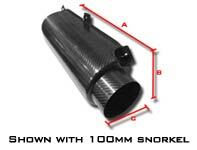 The Air box size guide shows the part length (A) height (B) and Depth (C) of our range of air boxes. 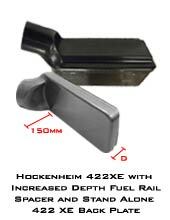 When using the guide allow for the depth of the back plate when finding the depth of the air box for example the Hockenheim 422 has a total depth of 239mm on its own and a depth of 259 using standard Base Box. This guide is available for download here! The Hockenheim range is a versatile group of products allowing for easy customization with the ability to trim the air box to fit any engine bay and the potential to bond single or multiple inlet pipes to any face on the air box. The 422 and 405 Air boxes can be used with an internal ITG Dome filter bespoke to Reverie designed to optimise air flow through the box. Like all of our air boxes the Hockenheim can be used with an air induction kit allowing for the use of ram air scoops. The Zolder air box range can be fitted to most four cylinder engines, unlike the Hockenheim 422 range, the Zolder range are pre sized and not designed to be trimmed, however they are available in shallow or deep varieties allowing for use in most vehicles even where space under the bonnet is at a premium. Like the Hockenheim the Zolder air box can also be used with an internal ITG dome filter, the version for the Zolder has a gasket integrated into the filter for a good seal. The Silverstone air box is one of the most popular air boxes in our range; it has been designed to package a 152mm K&N cotton gauze filter which can be used with a range of adapters to fit various ducting sizes. The back plate can be specified as either alloy or carbon fibre and a range of accessories such as increased depth fuel rail spacers allow for fitment to a difficult engine. 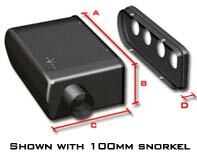 Like all of our air boxes, the Silverstone can be used with an air induction kit to add a ram air scoop. The Sebring air box range is designed to fit most four cylinder engines and is intended for use with oval inlet pipes. 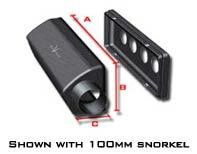 The inlets can be bonded into any of the four faces allowing for easy fitting. Sebring air boxes are intended for use with rectangular air filters; K&M air filters are recommended and can be supplied with the air box (sold separately). 75mm inlet pipes or 75mm/100mm Oval outlet intakes are most suited for use with the Sebring. The Sebring can be used with our air induction filters. The Interlagos 4CL air box can be fitted to most four cylinder engines and can be trimmed to ensure a perfect fit, the outlet to the throttles can be mounted on the back plate or on any of the three faces of the box, in this configuration the back plate can be used as an access / inspection panel. Intakes, inlet pipes or trumpets can be bonded to any face of the air box to allow connection to an air induction kit or canister. An inlet that is too small will cause a pressure drop inside the air box restricting performance. This sizing guide shows the minimum recommended inlet and ducting size for a power output category. The larger the power output of an engine the more air it will require to run at peak efficiency, therefore a larger inlet pipe/duct is needed as power increases. Multiple smaller intakes/inlet pipes can be used to achieve the same open inlet area as a larger intake/inlet pipe, for example if a larger inlet won't fit on the air box, multiple smaller inlets or oval outlet pipes could be used to create a comparable open area. High flow alloy straight trumpets can also be used as intakes.